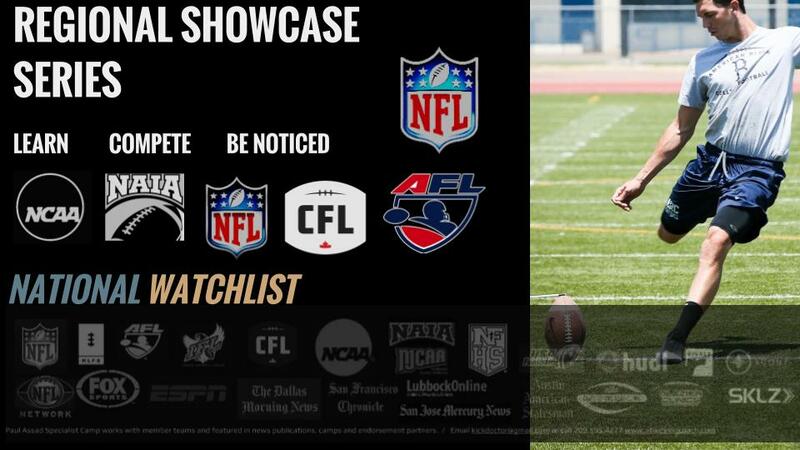 Participation in the Paul Assad Specialist National Watch-List Regional Series is limited to current and former Specialist Position High School and College Players and are events specifically designed for players trying to get an opportunity by participating in NFL and College level by participating in Showcase Combines that test their ability - technique and competitiveness kicking field goals, kicking off, punting, and long snapping. These are Future Pro and College Prospect Identification Player Testing Camps and Combine Concept events that are limited to players who are eligible for the 2017 Draft - Future Draft Prospects - Collegians on Roster and Prep / Juco Players who will play college and Prep football during the 2017 - 2021 seasons. The cost to participate in the NFL Regional Combines is $175 and Invitational Events vary. 92% of NFL Teams have Players from the Paul Assad Specialist Camp Player Development and Combines and over 2000 College Players have participated in past event. There have been 50 starters on 53 man regular season NFL Rosters - 220 Participants signed to NFL Free Agent Contracts - 20 Draft Selections and 20 Pro Bowl Honors. The Paul Assad Specialist Camps are an independent Scouting and Player Development Network launched by former Director of Scout Camp Pro Football Regional Combines aka NFL Regional Combines Director Paul Assad in 1996 to serve as a supplement to College and Pro Football Scouting. They are designed to provide an opportunity for participants to display their pro and college potential and have successfully done so for 21 years. Pro Events are conducted specifically for Players who will be eligible for the 2017 Draft and NFL Combine and Collegiate Players to get their name on the radars as underclassmen. 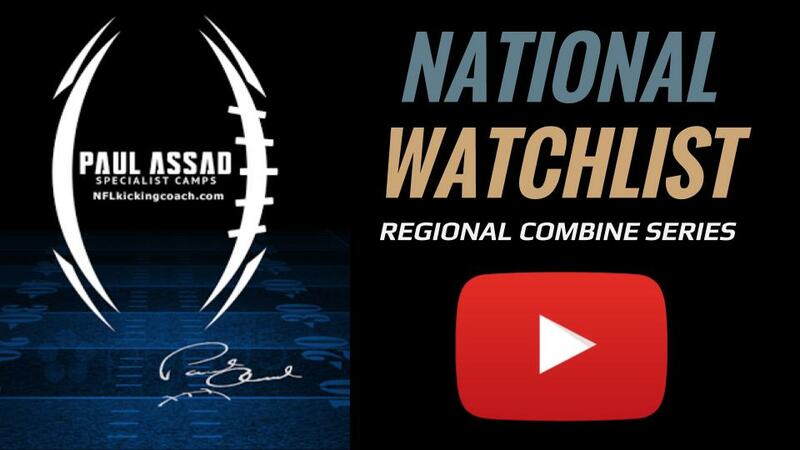 Paul Assad National Watch-List NFL and Collegiate Regional Showcase Series events are for serious scouting and recruiting efforts and not fantasy camps. Applicants must meet College and NFL eligibility rules and be able to participate at the next level and required to perform at a high skill level to be considered by Collegiate and Pro Personnel. Paul Assad National Watch-List reserves the right, in its sole discretion, to reject any applicant it determines to be unqualified or unfit to compete. 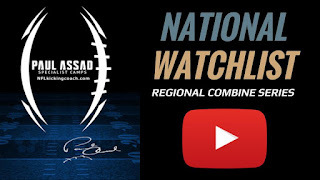 The Paul Assad Specialist National Watch-List Regional Series Events are held at various U. S. Regional facilities and participants are tested and reviewed by experienced scouting personnel. 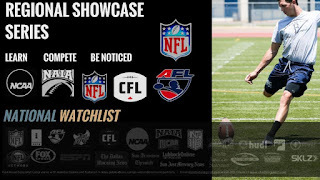 Participants’ results, including video of their Testing are compiled and entered into a database accessible to all 32 NFL clubs - The Canadian Football League - Arena - Indoor Football and close to 700 NCAA and NAIA and Hundreds of Community College Football Programs nationwide. This data will be posted to the National Watch-List website after each event. Each participant will be able to access their profile page containing their results and video and have the option to share their page socially via email, Facebook, Twitter, and Google+. Pro and College Personnel will also be sent top prospect recommendations via email. Events will be televised online for College and Pro Personnel to view streaming live and edited versions.